Our popular 2019 Craft Shows! 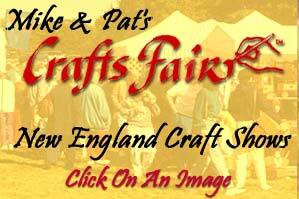 Mike & Pats New England Craft Shows are known as the best in New England. We promote craft shows in Connecticut, Massachusetts, and Rhode Island. You'll see from 100 to 250 artisans at all of our juried, well-balanced shows. Crafts vary from show to show but you'll always find a good assortment of country crafts, gel candles, floral arrangements, adults and children painted clothing, dolls or bears, jewelry, and woodcrafts. If you are going to a particular show and want more information as to what crafts will be at that show, you can e-mail us and we will be happy to provide you with that information. Mike & Pats has an unmatched commitment to a well-balanced show of well-made, handcrafted crafts. You'll find a link to our show schedule at left. Over the years Mike & Pats shows have been growing with great success and we believe the quality crafters who have been with us are the foundation of our success. click here for free coupon!